To talk about this realisation, though, is like trying to tell newly pregnant parents that their life will change — it's true but it’s also annoying. It's true that your life will never be the same, it's annoying when it comes clad in a smug 'I know something you don't know'. EVERY parent, if they are honest, will tell you that having a child is one of the most powerful, overwhelming, awe-inspiring experiences you can have – if you choose to see it like that. If you embrace the remarkable mathematics of our chance existence and the deep custodial urge that is programmed into us when we see a newborn child, it is truly humbling. Adopted, borrowed, bred or simply met for a moment, it doesn’t matter a at all when you see that little miracle made flesh. Like sunsets, mountains, and vast expanses of sky or water – some sights are incredibly humbling. A friend without kids was expressing that she thought that she would never experience this feeling. I sincerely asked her, 'Have you ever been in awe of nature? Just looked at something and was overwhelmed by a feeling of perfection, symmetry and interdependence?' I hope we all have at some point. And I suggested to her that 'this feeling is what it feels like to look at your kids sometimes'. Kids are both AWE-SOME and AWE-FULL in equal doses. Just like nature. This leadership moment is one to relish, to explore and grow through. Nature is so awe-inspiring, it's humbling. Human nature is the same. My kids are extraordinary. I know everyone says that, but mine really are. They achieve amazing feats and they demonstrate unbelievable compassion and wisdom. To be honest, I am simply in awe of them. Their achievements create cause for people to regularly express to me how amazing they are, and I agree. These people also express to me how proud I must be, and I disagree. I don't feel like 'pride' is the right word, it's way too possessive. Instead, I am in awe of them. And AWE is the key to humility. I did not make my kids into who they are. Their achievements are not mine. They are the ones who are revealing themselves perfectly in every moment of their existence. Just like you and everyone you interact with are, even the ning nongs. Seriously. Everyone. Awe is the key to humility. Leaders understand that humility is not thinking less of yourself but rather thinking of yourself less. Leadership is contemplating the needs of others before yourself while using that centre of attention to move beyond the limited, petty, selfish, paranoid, addicted, labelled self. 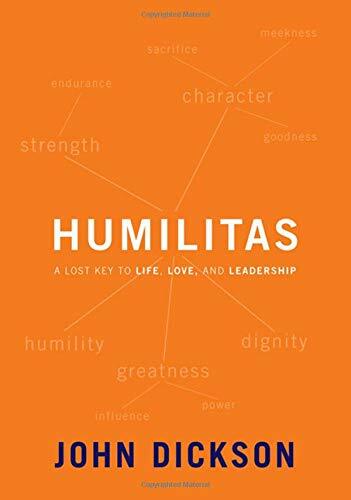 Humility is the theme of a great book a friend of mine John Dickson wrote, its title: Humilitas. A great leadership read and very appropriate this month. You are not the voice in your head, you're bigger than that. The best version of yourself is above not below the line. Your purpose on earth is to discover who you are deep inside yourself and to appreciate the awe-inspiring vastness of your awareness. These things cause you to drop to your knees in humility, to forgive and forget the things we and others do and instead reach deep inside to find, peace, love and joy. For you and for everyone you spend time with. Leaders understand that humility is not thinking less of yourself but rather thinking of yourself less. P.S. And the days that doesn't happen — when the awe-some is instead awe-full — I invite you to see if you can find peace there too. I am working on this and have found that sometimes we acquire greater learnings through less desired experiences.